The first images I recall of the Kennedy Assassination are grainy black and white television broadcasts. I was in the fourth grade 50 years ago today, and after an anguished announcement on the public address system, we were sent home. The TV was on in the living room with solemn reports. What followed over the next few days was a stunning flow of amazing events, all rendered in a few hundred flat lines of grey tones. I remember a strange mix of feelings, awash in horrible facts relayed by reassuringly familiar news correspondents. Those sober faces, rendered the same way as the thousands of hours of TV I had already consumed, helped me accept what had happened. Maybe it was my youth, but even the repeated rebroadcast of disturbing video clips–Jack Ruby’s shooting of Oswald in particular–eventually became an acceptable, if terribly sad, part of reality. The Zapruder film upended that complacency. I first saw frames from the film in Life magazine shortly after the shooting, but their impact was minimal. They were static and in black and white. The full color version of the film was kept from public view for many years due to intellectual property restrictions, and it wasn’t until 1975 that it had a widespread public viewing. But even then most people saw the film on distinctly non-HD television, and perhaps not in color. I didn’t see the film clearly until 1991 when it was used as part of the movie JFK. The lurid Kodachrome colors, the oddly intimate home movie jerkiness, the abrupt transition from banal to horrific–the film was a waking terror dream, something that couldn’t be happening actually was happening. The nightmare quality was further enhanced by radical differences the film had from the original TV coverage: overly saturated colors in contrast with drab black and white; eerie silence in contrast with the soothing voices of newscasters; powerful, gut-churning visual reality in contrast with calm narrative descriptions. With the internet came another change in my visual impression of the assassination. 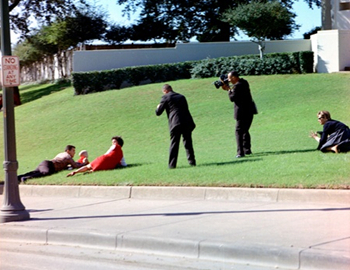 Beforehand, the Zapruder imagery was not in plain sight. But with digital versions proliferating on the web, the film was suddenly much more available in all kinds of different ways. It regularly showed up as images or clips in news stories and in essays; it was dissected in academic papers (such as A 3-D Lighting and Shadow Analysis of the JFK Zapruder Film (Frame 317) (PDF). It became a staple of sites dedicated to video content, and anyone with a internet connection can view titles such as The Undamaged Zapruder Film, Zapruder Film Slow Motion (HIGHER QUALITY) or The Inky Face Trajectory In The Zapruder Film. All this has altered my visual model of the assassination. I’ve moved from a purely rational, analog-based acceptance from what I originally saw on TV to a digitally-driven sense that the event lives in some strange, uncomfortable zone that resists clear-cut recognition or acknowledgement. While I have never seen compelling evidence of a conspiracy, I can easily see why people are drawn to the idea. Those 26.6 Zapruder seconds have a strange hallucinatory impact that seemingly builds each time you watch. It’s natural to try and explain what looks a delusion, especially one that streams over and over again to your own computer screen. This is a syndicated post. Read the original at The Signal: Digital Preservation 2013-11-22.